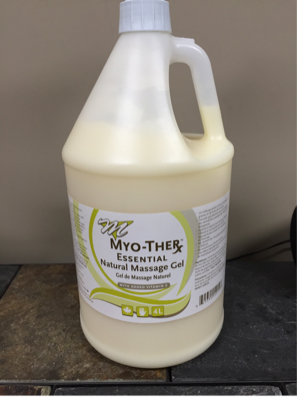 Our most commonly used product for our Massage Therapy Services is a Professional Massage Gel. We have 2 brands that we use, Bon Vital Coconut Massage Oil, or Biotone Advanced Therapy Massage Gel. Other Massage oils that we have in office are Pure Coconut Oil, Grapeseed Oil and Apricot Kernel Oil. Our oils are not for resale purposes. This advanced therapy Massage Gel is a combination of Apricot oil, Sesame oil, Grapeseed and Canola oils, Coconut oil Ester, Vegetable emulsifying wax, Dimenthicone, Carbomer, TEA, Oleth 3 and Vitamin E. It has been proven to be hypoallergenic and safe. It is paraben free and leaves no greasy residue. Pure Coconut Oil: This form of coconut oil is a solid at room temperature and must be heated to be used as a liquid oil. It has many health benefits, including protecting skin from microbial infections, incredibly moisturizing, strengthens the immune system and may even improve bone health. Grapeseed Oil: Pure Grapeseed oil is a light, thin, silky oil often used as a massage oil or a carrier oil for Essential Oil use. It is extracted from grape seeds, and is full of antioxidants. It may be beneficial for acne, chapped lips, dry skin, sun burns, stretch marks, arthritis among other things. Some studies suggest Grapeseed oil may strengthen the immune system. Apricot Kernel Oil: Pure Apricot oil is a thin, light and easily absorbed massage oil, often used in skin care and infant products. It is cold-pressed from the kernel (seeds), of the apricot fruit. It is a great moisturizer, and is said to have anti-inflammatory, anti-bacterial, and anti-septic properties, as well as being full of antioxidants. Essential oils are natural, contracted oils that have the fragrance and properties from the plant in which they are derived from. Commonly the oils are extracted using steam distillation or are cold-pressed from the peels of fruit, or stems, seeds, flowers or leaves of a variety of plants. Though these are natural, they must be utilized with great caution, natural does not necessarily mean safe for everyone. Essential oils should be used to help support overall health, not as a replacement for medical care or advice. In our office, the use of Essential oils is because of their pleasant aroma and to aid in the benefit of the Thai Tibetan Aroma Oil Massage. 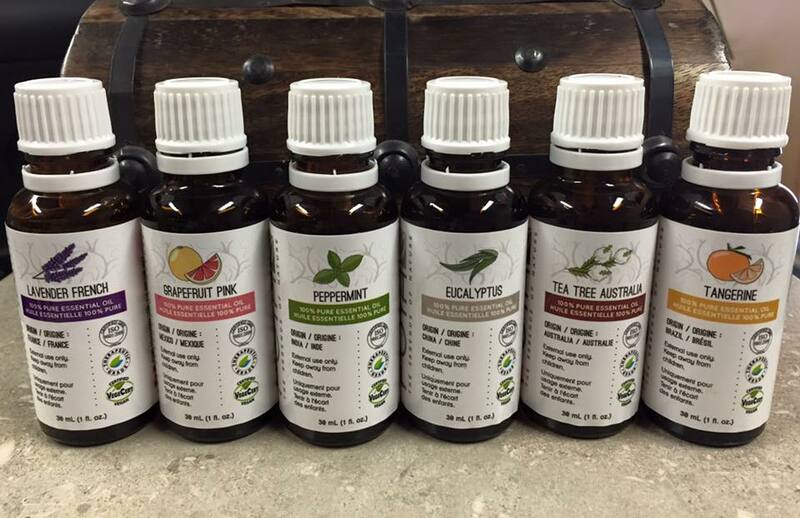 We use a select variety of therapeutic grade Essential Oils, including Eucalyptus, Grapefruit, Jasmine, Lavender, Neroli, Peppermint, Tangerine, and Vanilla. These oils are specifically utilized for the Thai Tibetan Aroma Oil Massage treatment and are not to be combined with any other treatment within our office. The Essential oils are only to be used by our Registered Massage Therapist and we do not have them available for resale purposes. The following is a guideline to the Essential oils that we use, and is not meant to be used in replace of medical care or advice. This is an incredibly versatile essential oil, best known for its anti-bacterial, anti-fungal, and anti-infectious properties. It has a woody and herbaceous aroma, and is steam-distilled from the wood and teal coloured leaves of the 'blue gum tree'. problems, as well it is believed to help control the spread of coughs and colds. 2. To aid in the relief of sore, achy muscles and joints. 4. Often used in bath oils and cleaners. 5. Considered safe for all skin types, due to its non-toxic, non-irritant, and non-sensitizing qualities. 6. Can help relieve mental exhaustion and sluggishness. Can help with stress and mental disorders. chest and back to help with conditions like chest colds, pneumonia, etc. Precautions with Eucalyptus Oil: Do not use if pregnant, or on certain medications, consult your physician beforehand. ​This invigorating scent is cold pressed from the peel of pink grapefruit grown in Mexico and has a fresh, sweet, citrus smell. It is often used to enhance the scent of other citrus oils, relieve muscle stiffness and fatigue, help aid in depression as a mood uplifter and as a natural tonic in beauty and skin are products. vitamin C which helps to boost the immune system. 2. It may help protect against certain vision problems, hearing problems and problems of the nervous system. muscle cramps/stiffness and retention of fluid. 4. Anti-microbial - May actually enhance the healing of cuts, wounds and burns. 5. Helps support the digestive system, particularly by stimulatining the endocrine function. 6. Disinfectant - Due to it's anti-viral, anti-septic and anti-microbial properties. 7. Stimulant/Anti-depressant - This oil has a stimulating effect on both mind and body. 8. Beneficial for oily or acne prone skin. ​Precautions with Grapefruit Oil: As with many essential oils, allergic reactions or sensitivities may occur. Particularly with citrus oils, photo sensitivity, in particular to the ultraviolet rays of the sun. Try to avoid direct contact with the sun for 12 hours following use of grapefruit oil. ​This essential oil is extracted from the jasmine flower. It is often considered beneficial as an anti-depressant, anti-septic, emmenagogue and cicatrisant, as well as a skin conditioner. It has a slightly sweet and soft, pleasing aroma. skin is cracked or on an open wound. It is often used to aid in treatment of eczema or dermatitits. ​This oil is steam-distilled from the purple flowers of a small evergreen shrub. It is often used as a tonic, cleanser, pain reliever and has cytophylactic properties that help promote rapid healing and may even help reduce scarring. It has a very calming, but distinct floral scent. 1. Sedative/sleep aid - Induces a state of relaxation with its incredibly calming aroma, and is often used to help induce sleep and may help to regulate sleep patterns. 2. Bug repellant - Commonly used to help repel lice. 3. Anti-bacterial/Anti-viral - Discourages air-borne illnesses, and is often added to cleaning products for this reason. Also may help to heal cuts and other wounds, and burns, as well as boost the immune system. 4. Pain relief - Lavender oil may help relieve pain in muscles and joints, or provide relief from migraines, stress, depression and nervous tension. 5. Tonic - Often used in skin products as a cleanser and toner, and may help with acne prone skin. 6. Due to its non-toxic, non-irritant, and non-sensitizing properties it is virtually safe for all skin types. 7. Digestive - Lavender can be useful for digestion, and may even help with indigestion, stomach pain, diarrhea and other stomach discomfort. 8. Circulation - It is commonly used to help lower blood pressure and increase blood circulation throughout the body. ​Precautions with Lavender French oil: Do not use if pregnant, or if taking certain medications. Consult with your physician before hand. Neroli has many qualities that may be beneficial as an anti-depressant, anti-septic, may help with skin infections and is commonly used in skin and hair products. This is oil is distracted by steam distillation from the flowers of Neroli, and is part of the citrus family. 1. Anti-depressant - This essential oil has an uplifting aroma and may aid those with difficulties like depression. 2. Anti-septic - It is said to help protect against infections, particularily skin infections. 3. Bactericidal - Neroli may help keep your body free of microbial infections and toxins and is considered to be anti- bacterial. 4. May help with the appearance of scars and other skin imperfections, and is overall good for the health of your skin. 5. Disinfectant - Can aid in fighting off coughs and colds, and helps to "disinfect' the body and surroundings. 7. Anti-spasmodic - May help to relieve pain from muscle cramps and spasms. 8. Digestive - Neroli can aid in digestion and may increase appetite. Precautions with Neroli oil: As with any essential oil, allergies or sensitivities may occur. This revitalizing scent is fresh and minty and it produces a cooling and refreshing sensation. It is a common garden herb that is steam distilled and grown in North America. It is commonly used to help with headaches, upset stomach, muscular aches and pains and to enhance alertness and stamina. 2. It can be used to cool down the body. 3. Anti-inflammatory/Anti-spasmodic - Commonly used to help with tension headaches and other muscle aches and pains, such as sprains and strains. 4. May help ease nausea, and fatigue. 5. May be used to help relieve menstrual cramping. 6. Helps with cold symptoms. 7. Repels insects, especially spiders. 8. Anti-septic - Commonly used for dental hygiene products. 9. Anti-fungal - Commonly used for fungus of the fingernails or toes. 10.Relieves stress and boosts the immune system. Precautions with Peppermint oil: This oil must be properly diluted. There are some possible side effects with Peppermint, such as heart burn, headache or allergic reaction. It may interact with some medications, consult your physician before hand. It is NOT to be used on children under 7 years old. Peppermint is contraindicated for those suffering with gallbladder difficulties, diabetes, gastro-esophageal reflux disease, or persons taking antacids. It should be used with great caution in pregnant or nursing woman. Tangerine essential oil is often said to smell very similar to mandarin, with a very sweet, radiant and tangy aroma. Tangerine oil is cold pressed from the peel of the fruit, and is rich in antioxidants. It is believed to have many properties including as a anti-spasmodic, digestive, diuretic, sedative, stimulant - both digestive and lymphatic, and as a natural tonic. It is believed to help clear the mind and eliminate emotional confusion. 1. Has refreshing and rejuvenating characteristics. It's aroma helps to clear the mind. 2. Sedative - Very comforting and soothing scent, helps with inflammation, anxiety, stress and hypersensitivity of allergies. 3. Anti-septic - Which help protect against infection, and boosts the immune system. 4. Anti-inflammatory - Both internally and externally. 5. Stomachic - Aids in digestion, by maintaining a balance between acid and bile so that excess acids are neutralized and helps to keep your stomach functioning properly. 6. Anti-spasmodic - helps prevent and ease spasm of muscles and organs. ​7. Helps to maintain moisture balance for your skin. 8. Tonic - Often used as a natural tonic in skin care products. Precautions with Tangerine oil: This oil make cause photo sensitivity to the suns rays. Avoid direct exposure to the sun for 12 hours following the use of Tangerine oil. Possible allergic reaction, or sensitivity, as with most Essential oils. this oil is generally considered to be non-toxic, non-irritating and non-sensitizing. This Essential oil is steam distilled from the twigs and leaves of Tea Tree commonly found in Australia. It is commonly used to treat infections, boost the immune system and as an additive for cleaning products. 1. Anti-bacterial/Anti-microbial - Found to be very beneficial in treating bacterial infections, particularily those found in the tropics, as Tea Tree oil is naturally found in tropical climates. 2. Anti-viral - Can help fight illnesses like the common cold or influenza. 3. Stimulant - This oil has a stimulating effect on hormone secretions, blood circulation and the immune system. 4. Fungicide - It inhibits fungal growth and may help with conditions like dermatitis and athletes foot. 5. Anti-inflammatory - Provides relief from muscle aches, strains and pains. Precautions for Tea Tree Oil: It is meant for topical use only, and is poisonous if ingested! It is thought to have a relaxing effect on the brain and nervous system, helps to soothe inflammation of many organ systems of the body, effective antidepressant and mood uplifter, as well as may help regulate menstrual cycles. It has a sweet, mellow aroma often used in beauty and skin care products. It is often extracted by solvent extraction of a resinous substance obtained from fermented vanilla beans. protect the body from infections, and stimulate repair of damaged tissues. 2. Anti-carcinogenic - Certain components of vanilla oil may help it curb the growth of cancerous cells. from natural vanilla but synthesized vanilla products can have the same benefit. 6. It can help regulate menstruation by activating certain hormones like estrogen. Precautions with Vanilla oil: This oil is considered to be mild and does not have any specific precautions, other than with all Essential oils, allergic reactions are possible.